Adam Henry Meyers was a prominent early settler at the mouth of the Trent River. There is no evidence that he is related to Capt John Walden Meyers who settled in the area. Adam Henry Meyers is seen throughout the early record and more needs to be known about the man. Thanks to Dave Barry of Peterborough who has been researching Adam H Meyers particularily with an interest to his activities and holdings in Seymour Township and has shared some of his work . Thanks also to Kim Douna for pointing out several key sources including the Donald Campbell Meyers Fonds at the Archives of Ontario. Land as mentioned in the above will. Records show that Adam Henry Meyers was born 24 Oct 1780 in the village of Hollen, near Bremen, Kingdom of Hanover, Germany. He came to Upper Canada about 1801 and first was a merchant in Thurlow. In 1808 he bought a mill at the mouth of the River Trent and settled there. He died 9 May 1832 at Port Trent [Trenton]. It is clear from his literacy that he was educated and likely arrived with some wealth in hand to establish himself as a merchant. Adam Henry Meyers states in his 1818 petition "That your petitioner is a native of Hanover [and] That he has been resident in the Province seventeen years". It is not known if he came directly from Germany or came earlier to America and then made his way to UC by 1801. The account below suggests he came directly with German manufactured goods to sell as a merchant right from the start. In the book Evolution of Trenton written in 1912 it says that the mill that he bought was "built by another UEL named Henry Ripsom" suggesting that Adam Henry Meyers was a UE Loyalist. A. H. Meyers does not appear on any Loyalist lists and he did not petition for land as a Loyalist. Also his children did not petition for land as sons and daughters of a Loyalist. Therefore it can be concluded that he was not a Loyalist. In 1807 Adam Henry Meyers "of Thurlow" marries Mary Holloway Wallbridge, daughter of Elijah Wallbridge and Mary Holloway. According to the book Pioneer Life on the Bay of Quinte (PLBQ), "Elijah Wallbridge, who was accompanied by his son William H., first came to Canada in 1800, and. two years later, bought from a surveyor named Smith two thousand acres of land in Ameliasburgh." See the book Descendants of Henry Wallbridge for more information on this family. The Wallbridge family were prominent in the area so it can said that Adam Henry Meyers "married well." Then in 1808 Adam Henry Meyers purchased the mill site on the west side of the River Trent about a mile north of the river mouth. He is said to be a "merchant in Thurlow" so it appears he moved from Belleville to the River Trent at this time. Canniff in his 1869 book states that, "Up to 1808 the site of the village was a dense cedar swamp. Two years before A. H. Myers had removed from Belleville and erected a mill about a mile from the mouth of the river, first a saw mill, afterward a flouring mill." There is also a statement in PLBQ stating that in 1808 AH Meyers had a store in Trenton. No record in Thurlow has been found during this time when he is establishing himself as a merchant and getting married. It appears that Adam H Meyers moved to the River Trent from Thurlow in 1808 and set up as a merchant and established the mill. He states in his 1818 petition that he "has erected two saw mills and a grist mill." From the 1808 purchase of the mill site it is clear that a mill already existed on the site. Likely he made many improvements. Adam was an Ensign in the First Northumberland Regiment during the war of 1812 and had a significant roll in bringing and distributing arms in the area in 1814. In 1816 he is promoted to Lieutenant and later a Captain. See this 1822 and 1823 roll of his Company. The account below states that he ultimately was promoted to Lt Col in 1832, the year he died. In 1820 Adam builds an Inn/storehouse right at the ferry docks on the west side of the Trent. This comes from his 1820 petition for the ferry lease rights where he states that, "I have been to the expense of putting up a large building say 32 feet by 42 feet square and two storey and a half high on the waters edge at which door the ferry now lands." Dave Barry writes that AH Meyers "was the founder of the tiny Hamlet of Myersburgh [spelled Meyersburg in the 1878 Belden Atlas], below Campbellford in Seymour Township. I raised on a farm just south of the Village of Hastings Ontario, and Adam H Meyers owned this property along with another 1000 acres or so along the Trent River, near Hastings – this sparking my interest in him. 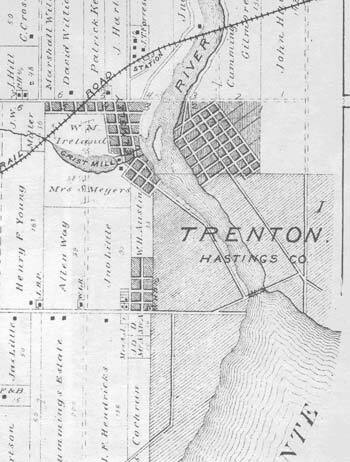 I believe Adam H Meyers of Trenton was a contestant for the coveted Mill Seat on the Trent River…the site of the Village of Hastings, that was awarded to the Honourable James Crooks in 1825. However, as a consolation, Adam H Meyers appears to have received Location Tickets for some 1200 acres of land on the Trent River at the site of Myersburgh, just nine days before the granting of this Mill Seat at Hastings. He already had a very major land and lumbering presence in the Hastings area at the time." By the time of his death in 1832 he had amassed a great deal of land so he was obviously an able man at accumulating wealth. In his will, he asks to be buried at Carrying Place. No headstone for him has been located at the Carrying Place Cemetery. The account below is assembled from three versions of an account of his life. The original by Stephen Young is dated May 1888 and is followed by a copy with some changes and another copy with even more additions. These versions differ a little bit but obviously two were slightly later and incorporate much of the original text. They are found in the Donald Campbell Meyers Fonds, AO, F1372, folders 1-6-1; 1-7-1 and 1-8-1. This account differs in a few small ways from other records but appears quite consistent in general with the record found to date. and especially with the person of Adam Henry Meyers. Mr. Meyers was a British subject and was born in the village of Hollen in the kingdom of Hanover in 1780 and was educated in the Boroughs of Casselbrach and Werden. Being a man of education and extensive ideas he came to Canada early in the present century and settled in what is now the present city of Belleville about the year 1806. With a spirit of enterprise characteristic of his nation he brought with him for sale in Canada a large stock of European Manufacture. With his experience and knowledge he saw that the Trent River was superior to the then Meyers Creek [Moira River] and in 1808 he moved to the Trent now Trenton and opened the first store in that part of the country. Mr. Meyers settled in the township of Murray on lots 4 and 5, first concession of the said township soon after the beginning of the present century and consequently has always been considered one of the pioneers of this part of the country. But there were no roads of any kind at that time of his settlement in Trenton and the usual mode of travelling then was by Canoe either the ordinary long canoe of the Canadian or the light birch bark of the Indian. All the freight and baggage that the settler did not carry on their person was transported by batteaux or the Durham boats. All the produce used in the country that was coming up the Bay of Quinte was portaged upon wheels at the Carrying Place from the Bay to Lake Ontario. At that time there were a great many inconveniences connected with the early settlement of the land. There being no roads nor grist mills. Mr. Meyers, who was a general merchant and also largely interested in the lumbering business, erected the first grist mill and flouring mill in this vicinity and also a sawmill which were highly appreciated by the settlers. Previous to the building of the grist mill the people were at great inconvenience for the want of it. Several neighbors would club together and go to the stone mills many miles east on the Bay of Quinte in a canoe made of the trunk of a large pine tree which would carry a number of bushels of grain and probably they would be gone a week from their houses. At that time there were no roads only what were called Indian paths. The first main road was called the Danforth road (being named after him who cut it through and which is now called the York road ). The next road was made from the premises of Mr. Meyers leading to Percy [Township] and that only a winter road. All the first roads were made by lumbermen and being used only in the winter were scarcely passable in summer season. The first school was held in a room furnished free of rent by Mr. Meyers and the writer well remembers reading in a class at said school more than 60 years ago. What a vast contrast to the schools of the present day! The writer wishes to mention a circumstance or two to illustrate the wild state of the country at that time. One of the near neighbours of Mr. Myers had a number of oxen forming a vast team of about nine or 10 yolks which were on a certain occasion pasturing in a field adjoining the house. During the day a number of wolves came out of the woods and attacked a calf, which of course blatted thereby attracting the attention of the oxen all of whom bellowed so furiously that the wolves ran away with fear. This was witnessed by the lady of the house. On another occasion a bear attacked some pigs in their sty which was closed up at night, weighing from 50 to 100 lbs each. A bear came into the pen and taking hold of one with his teeth through the back and lifted it out of the pen and started away with it. The people of the house hearing the noise came out and drove off the bear, but the poor pig died soon after from the effects of the wounds. The writer could mention several other incidents that space does not allow. At that time there were no clergymen to administer consolable influences of religion, no Physician to call for in the hours of sickness. The writer cannot call to mind the name of the first clergyman nor the exact time he came to the vicinity as a regular clergyman but thinks it was between 1805 and 10. They came from the city of Kingston and people would come for miles to attend service and in fact some with ox teams with a sleigh called juniper and get their children baptized. Mr. Meyers loyalty was well known and appreciated for we find in 1810 he was appointed by the Governor to be ensign and promotions were in rapid succession and in 1816 he was appointed Lieutenant and in 1820 made Captain under Lt Col Bullock by Sir Peregrine Maitland, the Governor of Upper Canada. In 1825 he was transferred to the Northumberland militia and his appointment of Lieut Colonel of the same battalion in 1832, the year he died. The said Mr. Meyers lived to see a great many improvements in this part of the country and his children grown up to manhood all of whom have since followed him in death except a daughter, the Mrs Cochrane who still survives, the only direct representative of her father, although there are a number of grandchildren. 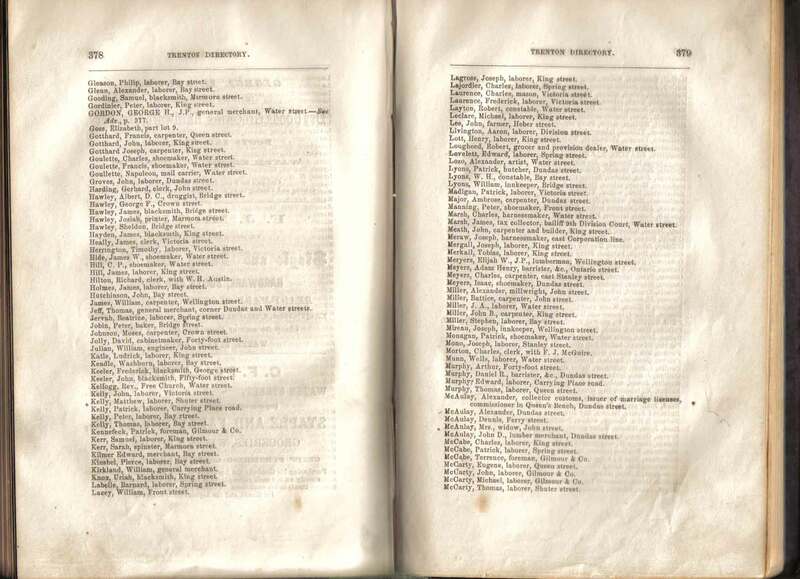 The various records below state that Adam Henry Meyers was born in Hollen, which at the time was a village in the Duchy of Bremen, in the Kingdom of Hanover, Germany and his obituary gives his age at death in 1832 as 51 years old. This gives a birth year of about 1780. BIRTH: Recorded as 24 Oct 1780 in a family genealogy in the Donald Campbell Meyers Fonds, AO, F1372, folder 3-0-1. OBITUARY: "On Wednesday morning, 9th inst., at the River Trent in the Township of Murray, Adam Henry Meyers Esq of that place, one of his Majesty's Justicies of the Peace for the Newcastle District and a native of bremen, in the Kingdom of Hanover, aged 51 years. Note: He therefore died 9 May 1832. Source: Death Notice, Christian Guardian (newspaper for the Methodist Church), York, 23 May 1832, Vol III, No 28, p. 111. Film at the United Church Archives of Canada, BX 8251.A22 C45 PS. Thanks to Kim Douna informing me about the above two references. "In 1808, Adam Henry Meyers, father of Col Adam Henry Meyers, a native of Bremen, in the Kingdom of Hanover, who came to Canada in 1805, settled at Port Trent and purchased the Ripsom property, where he engaged in the lumbering and merchantile business." Source: Historical Atlas of Prince Edward and Hastings Counties, H. Belden, 1878, Mika reprint 1977, p. iv. Note: The above is supported by the 1818 petition below which states that Adam came 17 years earlier from Hanover, Germany. He first was a merchant in Thurlow before purchasing the Ripsom mill in 1808. Some on-line databases state that Adam Henry Meyers was born in 1763 and the evidence found refutes this claim. His will below declares his wish to be buried in the Carrying Place Cemetery. 1. Marriage Licence for Adam Henry Meyers and Mary H Wallbridge to receive the "Holy banns of matrimony", dated 26 Jan 1807 under the Privy Seal of Office at York and signed by Wm Halton Secretary. 2. Whereas Mr Adam Henry Meyers of Thurlow and Miss Mary H Wallbridge of Ameliasburgh were desirous of intermarrying with each other, and have applied to me for that purpose, their Intention so to do, have presented a licence. Now these are to certify that I, John G Wigant, Minister of the Lutheran Congregation at Ernestown, Upper Canada have this day married the aid Mt Adam Henry Meyers and Misss Mary H Wallbridge together and the [y] are become legally contracted to each other as witness my hand at Ernestown this 27th Day of January 1807. Source: Original documents, Donald Campbell Meyers Fonds, AO, F1372, folder 1-6-1. Transcribed by Randy Saylor, 27 Mar 2012. Note: It is odd that the licence is dated at York and the marriage occurs at Ernestown one day later! Mary Holloway WALLBRIDGE, b. Aug. 16, 1784, at Milton, N. Y., d. June 15, 1852, m., Jan. 27, 1807, Adam Henry Meyers, a native of Hanover, Germany, living at the time of their m. at River Trent, Canada. He d. May 9, 1832. Source: Descendants of Henry Wallbridge, who married Ann Amos, December 25th, 1688, at Preston, Conn, with some notes on the allied families of Brush, Fassett, Dewey, Fobes, Gager, Lehman, Meech, Stafford. Scott, 1898, by William Gedney Wallbridge, (1856 - ), Philadelphia, Press of Franklin printing company, Internet Archive web site, pages 78, 111 and 112. 12 Jan 1808, B&S, Eliakim Weller, yeoman, of Murray Township and wife Lucy sell to Adam Henry Meyers, Thurlow, Merchant for �400 Upper Canada lawful currency, the broken fragments of lots 2 and 3, Con 1, 149 acres, "the western boundary of the River Trent - nearly a half mile above where the river discharges itself into the Bay of Quinte thence northwesterly along the waters edge against the stream to a creek which falls into said River .... all trees waters and water courses, mill houses, out houses, buildings and improvements and the reversion and reversions, remainder and remainders, rents, issues and profits thereof", witnessed by James Fulton of Hamilton Tp, Esq and William H Wallbridge, of Murray, Gentleman. Reg. 17 Jan 1808. The mill site is shown as "Grist Mill" on the old map. Today, this is located just north of the railroad tressel bridge in Trenton that crosses the Trent River where Front St becomes Water Street. Very little of the dam remains and there are 2 small bridges over the creek. 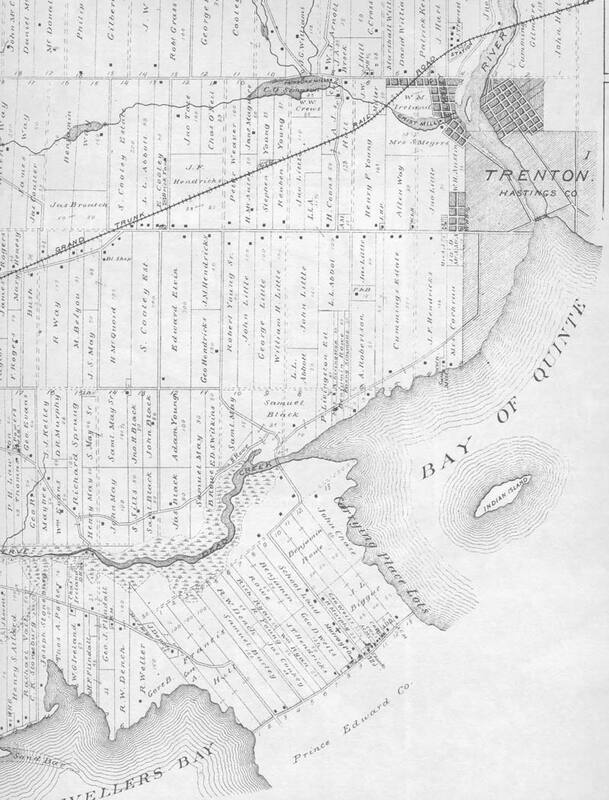 Click here to see a larger section of the 1878 map. "At the mouth of the Trent there naturally sprung up a village. Up to 1808 the site of the village was a dense cedar swamp. Two years before A. H. Myers had removed from Belleville and erected a mill about a mile from the mouth of the river, first a saw mill, afterward a flouring mill. Excepting the mills, and a very narrow road, the place was a perfect wilderness. The land upon the west side, where the village stands, originally belonged to 'old Squire' Bleeker. The portion of land between the river and Sidney was held by Dr. Strachan. The first lot in Sidney was owned by Judge Smith." "Col Adam Henry Meyers arrived in 1808 and purchased the first mill on the River Trent, which had been built by another UEL named Henry Ripsom. He was perhaps the first merchant of this little settlement." "John F Flindall was ambitious to succeed, and we find him, while a mere youth, employed as a clerk by Colonel Adam Henry Meyers, who had opened a large general store at the 'Trent' in 1808." 2 July 1811, B&S, Samuel Birdseye Gilbert, heir at law of Caleb Gilbert, late of the township of Sidney in the said Province, deceased, ... sells to Adam Henry Meyers of Murray Tp, for �50 Upper Canada currency, 100 acres, E 1/2 of lot 8, Con 4, Murray Tp, witnesses Simon McNabb? and Daniel Silver of Thurlow. Daniel Silver of Rawdon maketh oath that he was present when the indenture was executed. Reg 20 Feb 1816 in presence of Henry Rathebach?, Daniel Silver and H Ruttan, registrar. Adam H Meyers listed as Ensign in the First Regiment of Northumberland under Lt Col Peter Jones, from 6 to 18 Pct 1813. By 1822 he is a Captain and his roll for 1822 and 1823 has been transcribed. York, 12 October 1818, To Sir Peregrine Maitland, Lieutenant Governor …. The petition of Adam Henry Meyers of Murray, Merchant, That your petitioner is a native of Hanover. That he has been resident in the Province seventeen years, and has a family of a wife, five sons and 2 daughters. That your petitioner has improved, on lands he purchased in this Province, to the extent of nearly 200 acres, and has erected two saw mills and a grist mill. That your petitioner has ample means of improving waste lands, and is desirous of obtaining a portion of the waste lands of the town, having never received, nor having before applied for any. Wherefore your petitioner humbly prays that Your Excellency would be pleased to grant him such quantity of land under the existing Regulations as Your Excellency may deem meet. Note: A H Meyers was not the successful petitioner for the ferry lease. See web page on the River Trent for more information. PS I must further state that I own the land at the ferry west side of the river and have been to the expense of putting up a large building say 32 feet by 42 feet square and two storey and a half high on the waters edge at which door the ferry now lands and receives her freight being calculated for an Inn and to receive and forward goods Flour Potash etc etc and am now erecting a wharf for the accommodation of the steam boat Charlotte and other river craft. The building being very advantageously situated on the verry waters edge and passengers from the other side can allways be easy seen and heard from it when to the conterary the other houses on each side being more at a distance from the river and have known travelers to been hollowring for half an hour before he was heard. A H Meyers"
28 Sep 1820, B&S, Lewis Stiles of Hamilton Tp, at Hope in Newcastle District, carpenter, sells to Adam Henry Meyers, Murray Tp, Gentleman for �200 Upper Canada currency, 75 acres, lot 19, Broken Front, Con A, Murray Tp with houses and outhouses. Witnesses William Bullock and John Turney both of Murray and required to be registered by Stoddard Comstock. Reg 15 May 1821. These land record pages also need to be examined from index on GS4768. This is the second Myres island. An attempt was made in 1837-8 to make a lock in the Trent River at the foot of Myers or Meyers Island in a "dry channel" between the island and shore. There were problems and nearly $20000 was spent on the project but in the end it was abandoned in 1839. This Island was situated in the Trent River near where AH Meyers had his grist mill just above Trenton as seen on the map above. Today this island is attcahed to the western shore of the river. Source: A Respectable Ditch, A History of the Trent-Severn Waterway 1833-1920, James T Angus, McGill Queens Press, 1988, pp 57-9, 407. Also see Guillet below, 154. There are two islands named after the land holdings and ventures of AH Meyers. One is in Seymour Township opposite Myersburg on the Trent River. Samuel Wilmot, surveyor, reported in an 1832 inspection the presence of Adam H Meyers mill dam at Woods Creek on lot 3, Con 2 in Seymour and that lumber had been cut by Meyers on lots 2, 3 and 4 in Con 5 of Seymour. I beg leave to state to you for his honour the President’s information that several of the American vessels have been for some days near the shore opposite the District of Newcastle, particularly the Presquile Isle or Newcastle Harbour that if it meets His Honours approbation I should wish for Eighty or a Hundred stands of Arms for the 1st Regiment Northumberland Militia with three of four thousand rounds of Ammunition and three or four hundred Flints as we have no Flints that are fit for service and not more than thirty stand of Arms with about 500 rounds of ammunition. Ensign A H Meyers who is the courier of this will take charge of such arms, as you may think proper to send and I beg leave to ask if it would not be necessary to order a Captains Party of Northumberland Militia to guard along the shore of the District to prevent possibly the mills etc. from destruction. By advice of Major Rogers Army I have stationed a guard of a sergeant and twelve men at John's creek Hamilton as there is a quantity of flour at the mill and a Depot of provisions near that for the service of Troops going to or returning from the Army up the country which I hope will meet his Honour's approbation until his further pleasure is known this guard commenced the 4th Inst. And I beg leave to ask you further if my son and myself could not be furnished with swords from Government stores until I can furnish ourselves, ours having been taken from us as before reported to you if they can be allowed Ensign Meyers will take charge of them. Relative arms, etc Guard? For the defence of the harbour and wishing that two swords might be sent up for him and his son. Put on board a bateaux in charge of Ensign Meyers of the 1st Regiment of Northumberland Militia the following arms, etc directed to the care and charge of Lieutenant-Colonel Peters of the Northumberland Militia. Secondly - I give and devise unto my eldest daughter Anna Margaret Corbett wife of Thomas A Corbett of Kingston lot number three and all I own that of number eight in the seventh concession, rear half of lot number seven, the whole of eight and nine in the eighth concession, number sixteen in the tenth concession and the south half of lot number eleven in the eighth concession all of the township of Percy. To have and to hold the same to her and her heirs and assigns forever - I do also bequeath her one yoke of oxen and the sum of one hundred pounds to be paid her by my executors within one year after my Decease. Thirdly - I give and advise unto my daughter Hannah Maria Meyers lots number twenty three and twenty four in the fourth concession, south half of twenty three in the fifth concession, number fifteen, sixteen, seventeen and one hundred acres of eighteen in the eleventh concession all in the said township of Percy. Also one hundred acres in the township of Dorchester obtained from Thomas Arnold Esquire to have and to hold the same to her and her heirs and assigns forever. And I do further the bequeath to her one half my household furniture including a piano forte, also a yoke of oxen four cows and twelve sheep and likewise one hundred pounds to be paid on her marriage out of my personals estate. Forthly -I give and advise unto my eldest son Adam Henry Meyers my brick house and lot in the town of Kingston and also lot number 12 in the first concession of Pittsburgh. To have and to hold the same with the apputenances unto him and his heirs and assigns forever. Fifthly -I give and devise unto my son and Elijah Wallbridge Meyers lots number three, four and five in the first concession of the township of Murray aforesaid. To have and to hold the same with the appurtenances unto the said Elijah Wallbridge Meyers his heirs and assigns forever. Sixthly - I give and advise unto my third son Justus Holloway Meyers lots number eight and sixteen in the second concession of Murray aforesaid and also the village lot and tavern thereon at the mouth of the River Trent in Murray aforesaid and likewise twenty one acres of land bought of Richard Henesey lying north of the Danforth road in Murray aforesaid together with a village lot purchased of John McAulay, blacksmith, at the mouth of the said River Trent on which my store stands, also lot number sixteen in the twelth concessions, number sixteen in the rear of the twelth concessions and twenty three in the fourteenth concession of Percy aforesaid, also one acre of land at Presqueille [Presqu'ile] bought of Benjamin Young and also the undivided mostly? of five acres and a quarter of land being part of lot eight in the sixth concession of Sidney held by me jointly with Robert Charles Wilkins Esquire of the Carrying Place. To have and to hold the same unto the said Justus Holloway Meyers his heirs and assigns forever. Eighthly - I give and devise unto my fifth son William Holloway Wallbridge Meyers lots number one and six in the first concession, one, two, four, five and six in the second concession, and one and three in the third concession, number four in the fourth concession, number one in the eighth concession, south half of one in the ninth concession all of the township of Seymour. To have and to hold the same with the appurtenances unto the said William Holloway Wallbridge Meyers his heirs and assigns forever. And it is my desire that my said son William Holloway Wallbridge Meyers the respectively maintained at college until he attain the age of sixteen years the expences whereof are to be defrayed out of the rent of the said premises in Seymour. Ninthly - I give and bequeath to Mrs Catherine ?? [hidden under fold] now living in my house in Seymour with ?? [hidden under fold] Hessman?? The sum of 50 pounds currency to be paid annually on the first day of January each year during her natural life. Tenthly – I give and devise the east half of lot number three broken front a, and part of number three in the fifth concession of Murray aforesaid, also 500 acres in the township of Marmora and 300 acres for which I have an order in Council but which I have not yet located unto and amongst my said seven children equally. To have and to hold the same as Tenants in Common and not as Joint Tenants. I hereby revoke all former wills by me made, hereby constituting this my last will and testament - in case any lands not hereinbefore enumerated owned by me shall not be sold by me or shall revert to my estate in consequence of the non payment of the consideration money. It is my desire that the same shall be divided among my said seven children equally share and share alike - I do hereby direct that lots two and three in the first concession of Murray aforesaid on the east side of the said River Trent after the Decease of my said wife or her marriage, and lot number two in the first concession of Murray aforesaid on the west side of the said River Trent shall be divided equally among my said seven children. And in the case of the death of any of my said children without lawful issue, I do direct that the share of the child or children so dying shall go to and be divided among the surviving children share and share alike. In witness whereof this twenty seventh day of December in the year of our lord one thousand eight hundred and thirty one [27 Dec 1831]. Whereas I Adam Henry Meyers of the township of Murray in the county of Northumberland in the Newcastle District area and Province of Upper Canada esq have made my last will and testament in writing bearing date the twenty seventh day of December in the year of our lord one thousand eight hundred and thirty one. Now I do by this my writing which I hereby declare to be a codical [sic] to my last will and testament to be taken as a part thereof. Secondly – I give and bequeath to my beloved wife Mary Holloway Meyers what is already expressed in my will and testament provided she will not exact a dower from any person or persons to whom I have sold and conveyed lands on other property. Nor exact demand or cause to be demanded her third of any part of the property of which I now possess and give by my last will and testament to my children, and in case she will demand any part of her third in any shape whatever contrary to my express wish in this my codical then and in that case I give and bequeath to her my beloved wife Mary Holloway Meyers no more than twelve shillings and six pence per year. Thirdly – I hereby order and declare that part of my will and testament to be void and of no affect whereby I gave and bequeathed to my son John Everett Howard Meyers, my farm in the township of Ameliasburgh being the number two Point A. And in place of the said farm I give and bequeath to my son John Everett Howard Meyers his heirs and assigns, lots numbers sixteen and seventeen in the eleventh concession of the township of Percy, to have and to hold the same for his only use and benefit. Fifthly – I give and bequeath to my daughter’s and Margaret Corbet [sic] and Hannah Mariah Meyers of their heirs and assigns forever, lot number Two Point A in the township of Ameliasburgh to have and to hold the same and the equally divided between them. Sixthly – I hereby order and declare that part is my will and testament to be void and if no affect whereby I appointed William H Wallbridge an execution to my will and testament, and I hereby require my trusty friend Sheldon Hawley Esquire of the township of Murray to act as an executor in place of William H Wallbridge Deceased. And lastly it is my desire that this my codical be annexed to and made a part of my last will and testament to all intents and purposes in witness whereof I have hereunto set my hand and seal this twenty fifth day of April in the year of our lord one thousand eight hundred and thirty two [25 April 1832]. 6. LAND as mentioned in the above will. 1. ADAM HENRY1 MEYERS was born 24 Oct 1780, Hollen, Hanover, Germany, and died 09 May 1832 in River Trent (Trenton, ON). He married MARY HOLLOWAY WALLBRIDGE 27 Jan 1807 in River Trent, daughter of ELIJAH WALLBRIDGE and MARGARET HOLLOWAY. She was born 16 Aug 1784 in Milton, NY, and died 15 Jun 1852. 2. i. ANNA MARGARET2 MEYERS, b. 24 Oct 1807; d. 12 Dec 1870.
ii. ELIAS VON HOLLAND MEYERS, b. 22 Feb 1809; d. Abt. 1809. 3. iii. HANNAH MARIAH MEYERS, b. 03 Dec 1810; d. Aft. Dec 1892.
iv. ADAM HENRY MEYERS, b. 18 Jul 1812; d. 31 Jul 1875. 4. v. ELIJAH WALLBRIDGE MEYERS, b. 24 May 1814; d. 21 Aug 1868.
vi. JUSTUS HOLLOWAY MEYERS, b. 18 Apr 1816; d. 09 May 1837.
vii. JOHN EVERETT HOWARD MEYERS, b. 19 Jan 1818; d. 20 May 1839. 2. ANNA MARGARET2 MEYERS (ADAM HENRY1) was born 24 Oct 1807, and died 12 Dec 1870. She married THOMAS AUGUSTUS CORBETT, 6 Mar 1828 at River Trent. He died 02 Jan 1874. 3. HANNAH MARIAH2 MEYERS (ADAM HENRY1) was born 03 Dec 1810, and died Aft. Dec 1892. She married JOHN COCHRANE. He died 16 Feb 1842.
ii. MARY COCHRANE, b. 03 Feb 1839. 4. ELIJAH WALLBRIDGE2 MEYERS (ADAM HENRY1) was born 24 May 1814, and died 21 Aug 1868. He married SOPHIA BIRDSALL. She was born Abt. 1825, and died Aft. 1881.
i. ADAM HENRY3 MEYERS, b. Abt. 1843; d. 1891.
ii. ELIJAH MEYERS, b. Abt. 1844.
iii. WILLIAM FREDERICK MEYERS, b. Abt. 1846.
iv. MARY H MEYERS, b. Abt. 1847.
v. ROBERT DAVID MEYERS, b. 1857.
vi. DONALD CAMPBELL MEYERS, b. 1859.
vii. WALTER HERBERT MEYERS, b. Abt. 1868. From the book Descendants of Henry Wallbridge, who married Ann Amos, December 25th, 1688, at Preston, Conn, with some notes on the allied families of Brush, Fassett, Dewey, Fobes, Gager, Lehman, Meech, Stafford. Scott, 1898, by William Gedney Wallbridge, (1856 - ), Philadelphia, Press of Franklin printing company, Internet Archive web site, pages 111 and 112.
i. Anna Margaret Meyers, b. Oct. 24, 1807, d. Dec. 12, 1870, m. Thomas A. Corbett, who held the life office of High Sheriff of Kingston, Can., until his death, Jan. 2, 1874. Mr. and Mrs. Corbett left four sons and one dau., the latter m. S. R. Balkuil, of Tacoma. Of the sons, Augustus and William were surgeons in the British army, went through the Crimean war and the Indian mutiny, and lived in India several years. Augustus d. in Eng., leaving a wife, one son, and four dau., the son is m., and lives in one of the Western States, was in the battle and charge at Batoche in the N. W. Territory. The eldest dau. is m., and lives near Brandon, N. W. Ter. The mother with three unm. dau. lives (1892) at Vancouver, B.C. William died in service in India, where his wife and daughters now live, one dau. m. to an army officer. Thomas d. in the Dominion mail service, and Dr. Henry in military service in the N. W.
iii. Hannah Maria Meyers, b. Dec. 3, 1810, m. John Cochrane, a Ch. of Eng. clergyman, who d. Feb. 16, 1842. Their two chi. d. in infancy, and the wid. was living Dec, 1892.
iv. Adam Henry Meyers, b. July 18, 1812, d. unm. July 31, 1875. He was a Barrister and M. P.
v. Elijah Wallbridge Meyers, b. May 24, 1814, d. Aug. 21, 1868, m. Sophia Birdsall, was a wholesale lumber merchant, left five sons and one dau., the latter is dead. (1) Adam Henry Meyers was a barrister in Toronto, Can., where he d. unm. in the winter of 1891, (2) Wm. Frederick Meyers, a ranchman in N. W. Territory, and member of the N. W. Leg. at Regina, (3) David Meyers, resides in Toronto, Can., is connected with a daily paper, he m. Miss Strong, and has two sons, Lewis Wallbridge Meyers and Adam Henry Meyers, (4) Donald Campbell Meyers is an M. D. and University lecturer on nervous diseases, of which he made a special study in Europe, (5) Herbert Meyers, a ranchman and fur dealer, residing with his bro., William F.
medical student, and accidentally shot. vii. John Everett Howard Meyers, b. Jan. 19, 1818, d. unm. May 20, 1839. Turnbull, of Belleville, Can. She is dead, her husband was drowned. Murray, 11 Sept 1833, Rev’d John Grier, minister to Murray, petitions saying that in January 1832 5 acres around the school house on lot 2, Con 1, Murray, was made for a church and parsonage, that the schoolhouse has been temporarily used as a place of worship and has been found much too small to contain those who resort to the public services of the church at that place … that as they are yet unable to erect a church that would meet the wants of the place eight or ten years hence, it is proposed to either enlarge the present schoolhouse or build a new one .. before they undertake either rof these plans they wish to have undisputed title to the ground. … prays for deed to the ground …. That Adam Henry Meyers Esq and Thomas Gainsforth be the trustees until such time as a clergyman. Lord Bishop of Quebec and Archdeacon at Kingston to be added to the trust. Toronto, 28 Dec 1839, letters and petitions about the W � of lot 3, Con 9 Sidney. Jeziah Bell claims he has occupied the land and applied to purchase it and for some reason it came up for auction on 14 Oct 1838 and he told the auctioneer about this. However it went ahead and Adam H Meyers bought the land knowing full well the claim and Meyers offered to sell the land to Bell at double the price. Meyers paid for the land by handing the auctioneer (A. Mannaker or Mannacham?) the UE Rights of one Robert Johnson in fee payment. Bell petitions for the land to be sold to him. Adam Henry Meyers was the member of the Legislative Assembly, Canada West, 1847 for Northumberland South.